A Vermont village estate built in 1847, on the National Historic Register. the heart of The Shires of Vermont on The Shires By-Way. You will enjoy your visit to the Arlington Inn – near majestic Mount Equinox in southern Vermont. This one-time colonial Inn and Vermont summer hotel is an ideal choice to for southern Vermont visit. Travelers will find four buildings on the National Historic Register offering 16 guest rooms, a full service restaurant and tavern. Modern amenities, include private baths, TVs, WiFi, air conditioning and two person Jacuzzi tubs complemented by historic niceties such as claw foot tubs, fireplaces, porches and patios. All rates include a full cooked to order country breakfast served in our garden solarium. Situated on four acres, the inn provides the perfect venue for weddings & romantic escapes as well as corporate retreats. 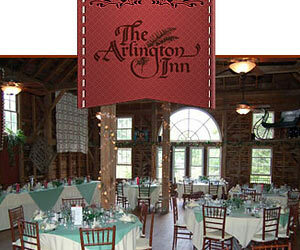 The Arlington Inn is located in the heart of The Shires of Vermont on The Shires By-Way. 12 miles to Bennington Vermont, 8 miles to Manchester Vermont and 16 Miles to Cambridge New York. A highly recommended historic Vermont Inn. If you would like to add your Southern Vermont Country Inn, Lodge or Bed Breakfast Inn to this web site, please contact us.